Sometime in the next century, we probably won't need to drive our cars anymore. But if the car is fun enough, we might just want to anyway. 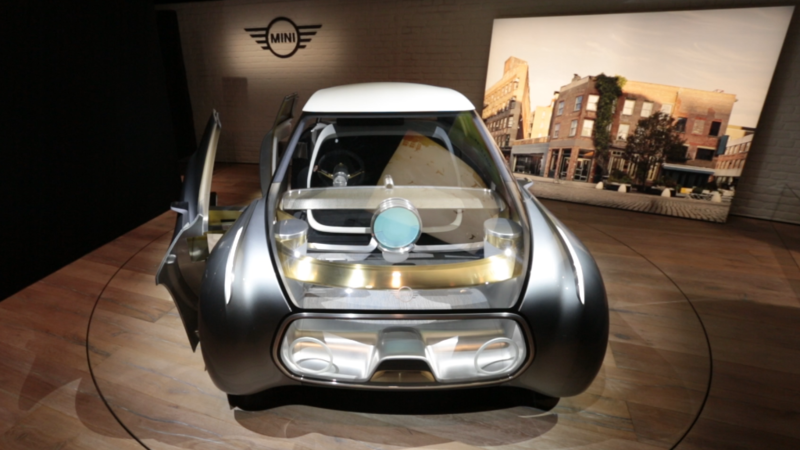 That's the idea behind the Mini Vision Next 100, a concept car unveiled in London Thursday. Yes, it has a steering wheel -- but you can move it out of the way if you don't feel like using it. The "driver" can even slide it on a track so someone in the passenger seat can take the wheel. 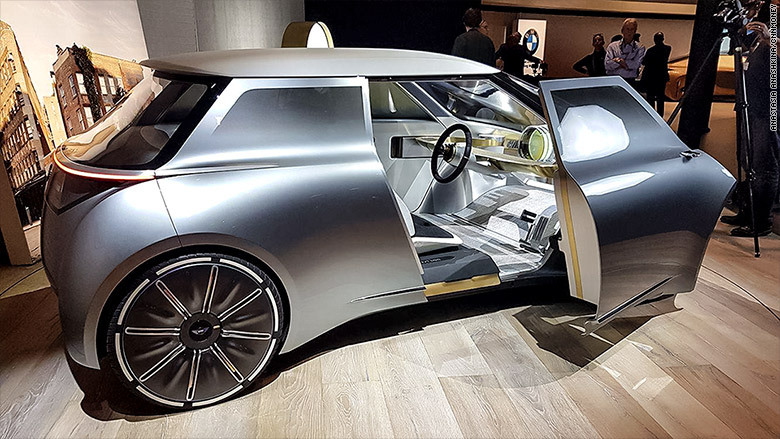 The Mini Vision Next 100 is meant to be a shared vehicle that will, nevertheless, feel customized for whomever is using it. The outside of the car is wrapped in a silver material that acts as a blank canvas that can display any color or pattern. Light colors inside the car can also change. You can select personalized entertainment and autonomous driving settings. The car's computerized persona can even suggest destinations and events nearby. These are all, of course, theoretical capabilities. The car can't actually do any of this. Although it represents what a Mini could be one day, the Mini concept brings back some automotive features from the past. For one, it has a bench seat, something that went out of fashion decades ago. It has the benefit of allowing both front seat occupants to enter and exit the car from either side by sliding across the seat. The Mini Vision Next 100 is also much closer in size to classic Mini Coopers, truly tiny cars that make today's Minis seem gargantuan. In the future, many industry analysts predict, technology will make crashes extremely uncommon, which gives Mini the freedom to go much more compact. Since there's no need for "crush space," the car's windshield extends all the way to the nose. A projector could project images, such as directional arrows, onto the road surface. Thanks to the car's full glass front, these images could be seen from inside the car. Although still manufactured in England, Mini is a subsidiary of Germany's BMW (BAMXY), which is celebrating its 100th anniversary this year. In recognition of its centennial, BMW has been unveiling a series of futuristic concept cars it calls its "Vision Next 100 Cars" cars. 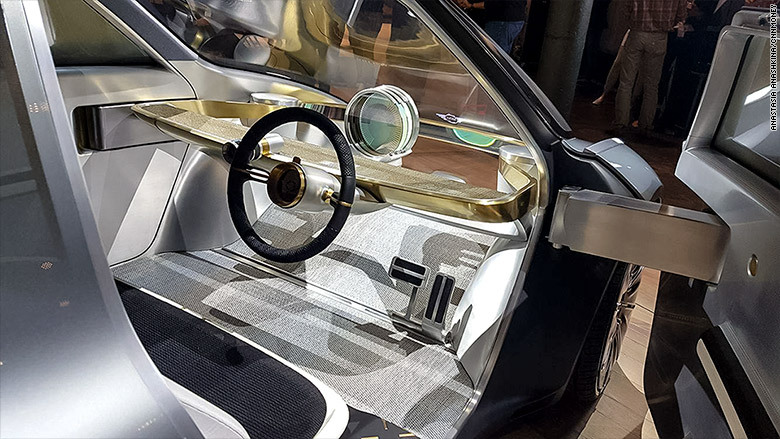 The BMW Vision Next 100 was unveiled in Munich in March, and the Rolls-Royce Next 100 -- Rolls-Royce is also owned by BMW -- was unveiled alongside the Mini.